Taylor Trautman recorded her first career double-double in the win over Bethel. ARDEN HILLS, Minn. – The Gustavus volleyball team won its seventh consecutive match Wednesday night, defeating Bethel University 3-1 to begin the Minnesota Intercollegiate Athletic Conference schedule. The Gusties won by set scores of 28-26, 27-25, 15-25 and 25-15 for their first win against Bethel since 2008, ending a seven-match losing streak against the Royals. Gustavus improves to 7-2 overall and 1-0 in the MIAC, while handing the Royals their second loss of the season who are now 9-2 overall and 0-1 in the MIAC. 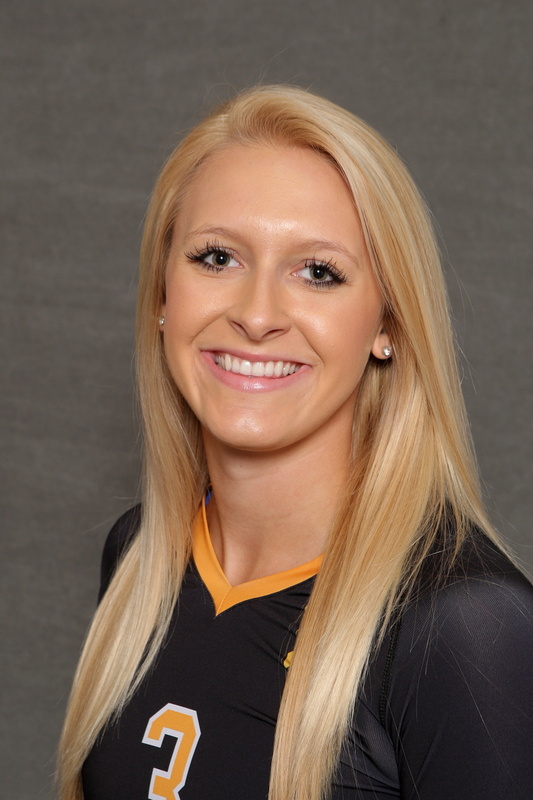 Taylor Trautman (Jr., Hutchinson, Minn.) proved to be a threat on both sides of the ball, recording her first career double-double with 10 kills and 10 digs. Trautman led the team with 30 total attacks and had five errors for an attack percentage of .167. In the first set, the Gusties and Royals battled back and forth with eight lead changes in the first 36 volleys, leading to a 19-19 tie. Bethel then scored three consecutive points to take a 22-19 lead, forcing a Gustavus timeout. After the break the Gusties took four of the next five points to take a 25-24 advantage and held set point. But the Royals responded with the next two to take the lead back. The Black and Gold then answered with three straight points, ending the set on a Bethel attack error. The second set was tightly contested as well, as the two squads never played outside a three-point spread. Tied at 25, the Royals faltered with consecutive attack errors and the Gusties took a 2-0 lead in the match. Bethel came out in the third with a renewed sense of urgency and claimed the first five points. Gustavus battled back to get within two points three times at 7-5, 13-11 and 16-14, but the Royals went on a tear, closing out the set on a 9-to-1 run. Bethel was efficient on the attack in the third, hitting at a .312 percentage while the Gusties shot .091. The Gusties put their mediocre third set behind them and took control of the fourth from the get-go. Gustavus opened the set with a 3-1 lead and never looked back. The Black and Gold led 10-4 early in the set, but the Royals battled back with a 7-to-3 run to make it 13-11, which forced a Gustavus timeout. After the break, the Gusties regained control of the set and finished it out on a 12-to-4 run to secure the victory. Along with Trautman, Alyssa Taylor (Sr., Trimont, Minn.) and Lauren Hanson (Fy., Redwood Falls, Minn.) recorded double digit kills with 10 each. Brittany Luethmers (Fy., Prior Lake, Minn.) and Becca Woodstra (Sr., Minnetonka, Minn.) held their own on the back line with 19 and 13 digs, respectively. Marisa Morgan (Rockford, Ill.) handled the bulk of the setting duties with a team-high 35 assists.